This is the third volume in David J.A. Clines’s monumental study of Job. The first volume came out in 1989, the second in 2006, and though the final volume was delivered to the publisher in 2008, it has finally seen the light of day here at the end of 2011. 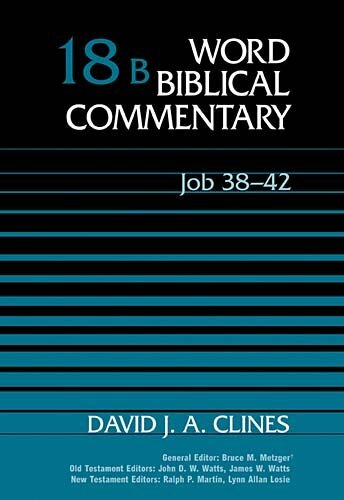 It consists of commentary on Job 38-42 (God’s response to Job, and the epilogue) in the first half of the book, and an extensive bibliography takes up the second half. The great strength of this commentary is its comprehensiveness. Perhaps no reader will agree with all of Clines’s interpretive decisions, but he does a good job of laying out the possibilities before he settles on a solution. While some readers might wish that Clines would “get to the point” a bit sooner (I did feel this way on occasion), the helpful aspect is that he leaves no stone unturned. Rather than offering a conclusion without justification, he interacts with other opinions. I came away with a much deeper knowledge of these five chapters, and how they have been interpreted, than I had before. Finally, a note about the format of the commentary. I’ve read several reviews of various volumes in the Word series that are critical of the format. For each passage (e.g, Job 38:1-40:2), there is a bibliography, the author’s translation, textual notes, notes on the form/structure/setting, verse-by-verse comment, and a final summary explanation. While the format is idiosyncratic, I think it is not so bad once you get used to it. If you are uninterested, for example, in the textual notes, they are all collected together so you can feel free to skip that section. Even if you don’t care for the format, this is still a commentary worth consulting. Previous Article Sermon: Why Doesn’t God Do Something?